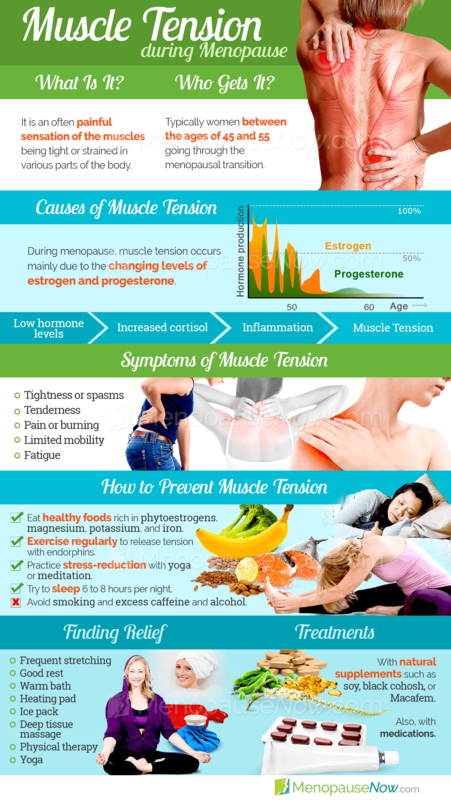 As women approach menopause, many will notice the onset of muscle tension. While this symptom is a normal aspect of getting older, there are treatments that can help alleviate muscle tension related to menopause. Women typically experience menopause and its accompanying hormone fluctuations between the ages of 45 and 55. This hormonal imbalance is typically responsible for muscle tension during the transition. Continue reading to learn more about muscle tension, its causes, and treatment options. Muscle tension is the feeling that muscles are always tight or strained, sometimes to the point of chronic pain. One can experience tension, pain, or cramps in any of the body's skeletal muscles as a result of muscle tension. The tension is closely related to stress and anxiety. The common symptoms of muscle tension are listed on the right. Continue reading to learn more about the causes of muscle tension. One possible cause of extreme muscle weakness is Guillain-Barre syndrome. The disorder occurs when the immune system produces antibodies that attack the nervous system. These antibodies can be extracted using a procedure known as "plasma exchange", or donated blood containing healthy antibodies can be administered. As mentioned above, hormonal imbalance is the primary cause of muscle tension in women approaching menopause. During the menopause transition, hormone levels - primarily estrogen and progesterone - begin to fluctuate as the body prepares to cease menstruation altogether. Both estrogen and progesterone play a part in causing muscle tension. First, estrogen helps regulate the production of cortisol, the "stress hormone." When estrogen is too low, levels of cortisol rise, raising blood pressure and blood sugar. Extended high levels of cortisol in the face of low estrogen levels causes the muscles in the body to tighten and become fatigued. Progesterone also affects the muscles. When levels of progesterone begin to drop prior to menopause, muscles tend to become tense. Continue reading to find out the best treatment options for muscle tension. Sudden weakness in legs can be very alarming. The nature of this condition is such that once it has happened to you the first time, you become acquainted with effective coping methods relatively quickly. To treat muscle tension, it's important to explore treatment options that get to the root of the problem while minimizing the risk of harmful side effects. To this end, it is generally recommended to begin with healthy lifestyle adjustments and then move on to other treatments only if necessary at that point. Lifestyle changes are the least obtrusive form of treating muscle tension. A woman who suffers from muscle tension should first try simple muscle stretches. It's also important to get enough sleep and eat a healthy diet high in protein and essential micronutrients. Alternative medicines are the next tier. These often involve herbal supplements, vitamins, and techniques like therapeutic massage. It's important to realize that there are some alternative medicines, sometimes called natural remedies, which will treat the symptoms but not the underlying cause of muscle tension. Because muscle tension largely due to hormonal imbalance, herbs that help to stimulate natural hormonal production are ideal. Finally, medications, such as painkillers, may be necessary in extreme cases of muscle tension. Although medications might be the only way to attain relief for some women, they typically come with side effects. It's crucial to consult a physician to develop an individualized treatment plan. Click on the following link to learn specific treatments for muscle tension, which begin with lifestyle changes, move onto alternative medicines, and finally, if those options don't seem to help, medications. The most effective treatments typically combine lifestyle changes and alternative medicines. Some of the most effective muscle relaxers aren't found in your local pharmacy, but right at home. Discover some of the best natural muscle relaxants to get back to living a pain-free life today. Muscle Weakness in Hands: What to Do? At the time of writing there is no known cure for motor neurone disease; however, there are some medications and treatments that are suggested for its management, and some which can slow down its effects. Medication known as riluzole is sometimes prescribed; this can reduce the sensitivity of motor neurone cells. 04/15/2016 Muscle tension and headaches during menopause affect more than half of women. These headaches are typically caused by fluctuations in hormone levels, specifically of estrogen and progesterone. Drinking plenty of water, stretching, and getting a massage are all beneficial ways to reduce stress and prevent these symptoms. 12/23/2015 While most leg pain can be attributed to reasonably common and unthreatening sources, such as injury or muscle cramp, there are a variety of other less well-known causes of leg pain. Uncommon conditions are listed in this article along with their fairly regular symptoms in order to highlight leg pain with less obvious underlying causes. 09/26/2011 Tai chi is an ancient martial art form that can be extremely beneficial for sufferers of chronic pain and muscle tension. Because it promotes physical well-being and mental relaxation, it is perfect for alleviating many menopause symptoms, including muscle tension. Learn more about how tai chi can help ease muscle tension during menopause. 09/09/2011 Although menopausal muscle tension can affect any muscle in the body, the muscles in the back, shoulders, and neck are often the ones that are affected the most. Read on to find out more about how to relieve muscle tension during menopause for reduced pain.